Toddler growing old with her three poodles is the only thing you want to see today! Little Mame, and her friend Riku, Gaku, and Qoo are giving us some friendship goals! Get ready to say "awwwww". The world is full of dog lovers who spend their lives making wonderful memories with them. Dogs, for most of us, are the most precious beings on earth, and the bond shared between a dog and a toddler is like two cute worlds colliding, making everything look magical. 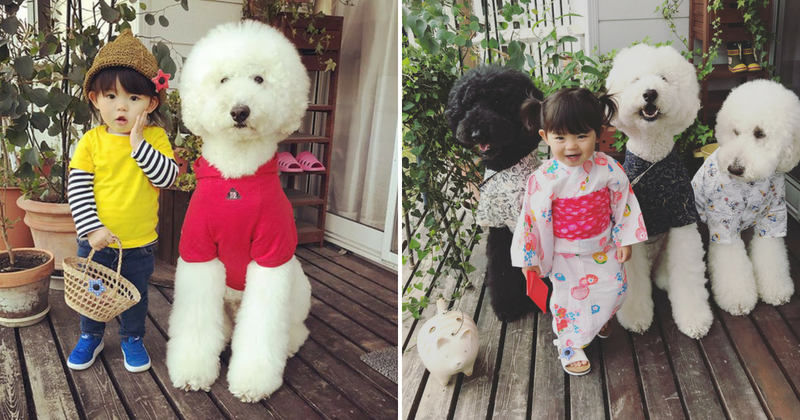 This Japanese toddler is melting our hearts on Instagram, as she poses with her three poodles in day-to-day activities, and we cannot stop looking at their pictures together. The little toddler's name is Mame, and her best companions are her giant poodles whose name are Riku, Gaku, and Qoo. Mame starts her day with her poodles and does everything with them. Here are the proofs, that is going to make you "aww" for every picture. Mornings like these will make getting up in the morning worth it. Little Mame and her cute poodles are inseparable, and we are loving it! The next thing little Mame does is a workout with her best friends. She makes sure that they all remain healthy and follow a healthy diet! Such determination! Then she gets ready to go for a walk with her three best friends. How adorable this is! On the way, if they feel tired, they like resting and living in the moment with a wide smile on their face. Little Mame makes sure that her best friends are happy! After a tiresome morning walk, Mame and her best friends wait for their breakfast and morning tea to arrive. Waiting can be exhausting sometimes! Finally, the breakfast arrives and little Mame and her poodles are happy to eat. The wait didn't go in vain, in fact, it's yummy! Little Mame makes sure that her best friends do their homework with her because she takes education very seriously. We wished we had someone like Riku, Gaku, and Qoo. After doing the basics, the little angel and her three best friends chill together. They love their story telling sessions. Technology is important, little Mame makes sure that Riku, Gaku, and Qoo understand it because what if they urgently needed to order Pedigree online?! Little Mame loves dressing up along with her best friend every evening. Therefore, they live together, laugh together and dress together!